A wheel wash was recently commissioned to ensure a landfill operation complied with EPA regulations by eliminating the potential of track-out onto public roads. 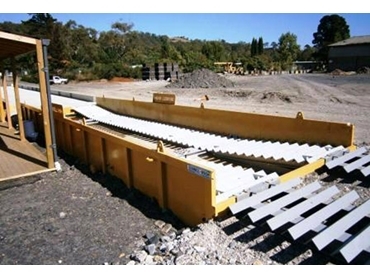 An AccuWash wheel wash bath was supplied by Accuweigh ’s Sydney branch to the landfill site in Bowral, NSW. Accuweigh’s wheel wash bath is a heavy duty metal tank fitted with access ramps to enable trucks/trailers to drive through the bath. The wheel wash bath has no moving parts and relies on the movement of the truck through the water in the tank to remove loose organic material such as dust and dirt from the tyres, wheels and vehicle underbody. The fully galvanised rumble strips distort tyre tread to assist with removal of stones and mud. Water must be regularly added to the bath to maintain a level suitable to wash the vehicle components and outlets allows the dirty water to be manually drained from the wheel wash bath. Over time, any residual sludge build-up must also be manually removed from the bath and disposed of responsibly. An AccuWash wheel wash bath is a very cost-effective means of meeting the minimum EPA requirements for a wheel wash system. The wheel wash bath is fully self-contained and does not require a power source to operate, making it ideal for use in temporary or remote locations where basic vehicle cleaning is required. Accuweigh has eight branches across mainland states providing superior product sales and service support on all facets of vehicle wheel wash baths and powered wheel wash systems.